American scholar. 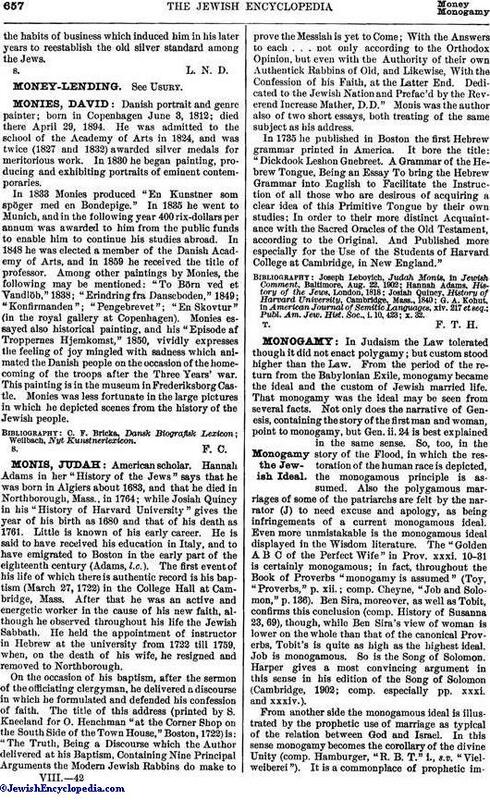 Hannah Adams in her "History of the Jews" says that he was born in Algiers about 1683, and that he died in Northborough, Mass., in 1764; while Josiah Quincy in his "History of Harvard University" gives the year of his birth as 1680 and that of his death as 1761. Little is known of his early career. He is said to have received his education in Italy, and to have emigrated to Boston in the early part of the eighteenth century (Adams, l.c.). The first event of his life of which there is authentic record is his baptism (March 27, 1722) in the College Hall at Cambridge, Mass. After that he was an active and energetic worker in the cause of his new faith, although he observed throughout his life the Jewish Sabbath. He held the appointment of instructor in Hebrew at the university from 1722 till 1759, when, on the death of his wife, he resigned and removed to Northborough. On the occasion of his baptism, after the sermon of the officiating clergyman, he delivered a discourse in which he formulated and defended his confession of faith. The title of this address (printed by S. Kneeland for O. Henchman "at the Corner Shop on the South Side of the Town House," Boston, 1722) is: "The Truth, Being a Discourse which the Author delivered at his Baptism, Containing Nine Principal Arguments the Modern Jewish Rabbins do make to prove the Messiah is yet to Come; With the Answers to each . . . not only according to the Orthodox Opinion, but even with the Authority of their own Authentick Rabbins of Old, and Likewise, With the Confession of his Faith, at the Latter End. Dedicated to the Jewish Nation and Prefac'd by the Reverend Increase Mather, D.D." Monis was the author also of two short essays, both treating of the same subject as his address. In 1735 he published in Boston the first Hebrew grammar printed in America. It bore the title: "Dickdook Leshon Gnebreet. A Grammar of the Hebrew Tongue, Being an Essay To bring the Hebrew Grammar into English to Facilitate the Instruction of all those who are desirous of acquiring a clear idea of this Primitive Tongue by their own studies; In order to their more distinct Acquaintance with the Sacred Oracles of the Old Testament, according to the Original. And Published more especially for the Use of the Students of Harvard College at Cambridge, in New England."